Berkeley College was among the honorees at the Commerce and Industry Association of New Jersey (CIANJ) and COMMERCE magazine Best Practices Awards reception, held on September 12, 2017, at Nanina’s in the Park in Belleville, NJ. Other recipients of the best practices award included notable firms such as Deloitte & Touche, Valley National Bank, Hackensack Meridian Health and Riker Danzig Scherer Hyland & Perretti. 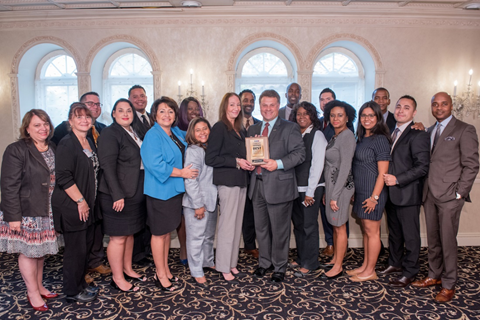 Berkeley College was honored for the best practice in the Office of Career Services that empowers students and graduates to realize lifelong success in dynamic careers. Lifetime career assistance is available to more than 50,000 Berkeley College alumni. From resume writing to interviewing for required internships, researching firms, establishing and sustaining digital footprints and employment, the department’s staff of more than 30 professionals provides one-on-one career counseling from the time a student first enrolls through and beyond graduation. The Berkeley College Office of Career Services conducts approximately 45 career fairs and 95 on-campus recruiting events annually. It also organizes 70 workshops and panels for students and alumni, including those for special audiences such as military and veteran students or those interested in a particular field. Photo Captions: (Above) Commerce and Industry Association of New Jersey (CIANJ) recognizes members of the Berkeley College Office of Career Services during the CIANJ and COMMERCE magazine Best Practices Awards reception on September 12, 2017, at Nanina’s in the Park in Belleville, NJ. (Top) Amy Soricelli, Vice President, Career Services, Berkeley College (left), accepts the Best Practices Award from Anthony Russo, President, CIANJ (right) on behalf of Berkeley College. The independent panel of judges selected award recipients in the areas of accounting, architecture and engineering, banking, contractors, environmental business, financial services, food and beverages, fundraising, healthcare, higher education, human resources, law, manufacturing, marketing/website development, real estate, supply chain, technology, utilities, and wine and spirits. You can see a full list of all Best Practice award recipients here.